The 47 foot long tugboat Shanon E. Settoon pushing a 154 foot oil barge allided with a pipline in Bayou Perot near New Orleans, Louisiana. 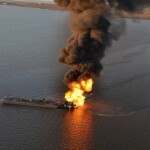 The tug and barge had veered out of the navigation lane into shallow water and struck the liquified gas pipeline resulting in an explosion and fire. 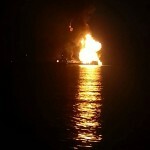 The barge’s 2,200 barrels of crude oil caught fire. 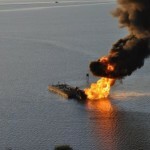 The four men on board the Shanon E. Settoon were able to safely rescued. All four men were taken to a local hospital where one crewman was treated for burns while another another treated for head trauma. 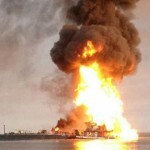 The Coast Guard responded to the scene placing containment booms around the vessels. 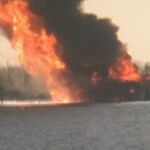 Officials shut off the pipeline and allowed some time to the fire to burn out. A Coast Guard investigation into the incident has been launched.